Double the party deluxe 5. 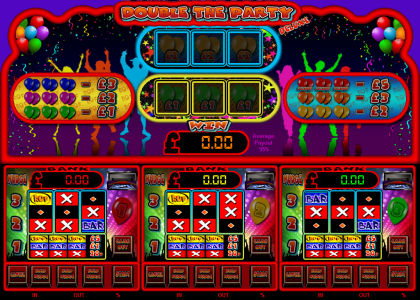 A UK Type 3 player arcade machine with a party theme. With a £5 Jackpot 10p play 95% payback. This game features random holds, nudges and hold after nudge. Feature entry is random from any winning spin, nudged win or held win, or even any losing spin!. When triggered, you get to spin the top reels for wins until a losing spin is spun, then you have a 50/50 chance of moving up to the extra paying top reels. This game has hide meters option and keyboard shortcuts. Once payment has been made please request your game code via email to activate your game fully. Game updates and codes are sent out as soon as possible.